That tappened. And it was, well, fanTAPstic. Puns aside, RhythM Tap Ensemble drew me in from the moment the curtain went up. For the first part of the opening number, “Cry Me a River,” the stage was dark. It was all shadows and the sound of synchronized tapping. I never would have expected a tap dance to “Cry Me a River,” but it worked. My only complaint was that the taps were louder than the music, an issue that was fixed for the remainder of the numbers. “It’s TAPpening” was a first for RhythM. In previous years, they teamed up with another student dance group for their show. This year, for the first time, they had a full-length performance dedicated entirely to them. In that performance, they displayed their creativity and versatility. They used a wide range of songs for their number — from an acoustic version of “Shape of You” by Ed Sheeran to the fast-paced “There’s Nothing Holding Me Back” by Shawn Mendes to the electro-house beats of “Five More Hours” by Deorro. But RhythM never bit off more than they could chew. The different styles worked together seamlessly. Rarely did something seem off, and when it did, it was fixed by the end of the number. However, the highlight of the show for me wasn’t any of those songs. It was “Acappella,” the first half finale. As the name indicates, the number eschewed a song altogether. Instead, it created its own song. I often don’t like a cappella tap numbers, but this one was done well and it was stunning. The group tapped out its own rhythm, perfectly in sync. The dancing became a kind of percussion. The rhythms became harmonies. And at the end, 16 dancers stopped, leaving just one, tapping solo, still creating her own beat. She started out quickly and slowed down gradually, finally giving in to the intermission as she stopped and the curtain fell. RhythM’s choreography burst with personality on the upbeat songs, especially “Shape of You” and “Five More Hours.” Both small-group numbers, the chemistry between the dancers was evident. In “Five More Hours,” the sass of dancers Emilia McCotter and Lexi Fata combined with their costumes — sparkly green tops and black leggings — perfectly encapsulated the party feeling of the song. The guest numbers were also a lot of fun, and all five groups that performed were talented. My only complaint was that Photonix — a glowstick performance group — came directly before “Acappella.” Photonix’s performance was so popular it may have overshadowed the following number, the best of the show. Still, the guest numbers provided a nice change of pace and added more to my list of student groups I need to see. 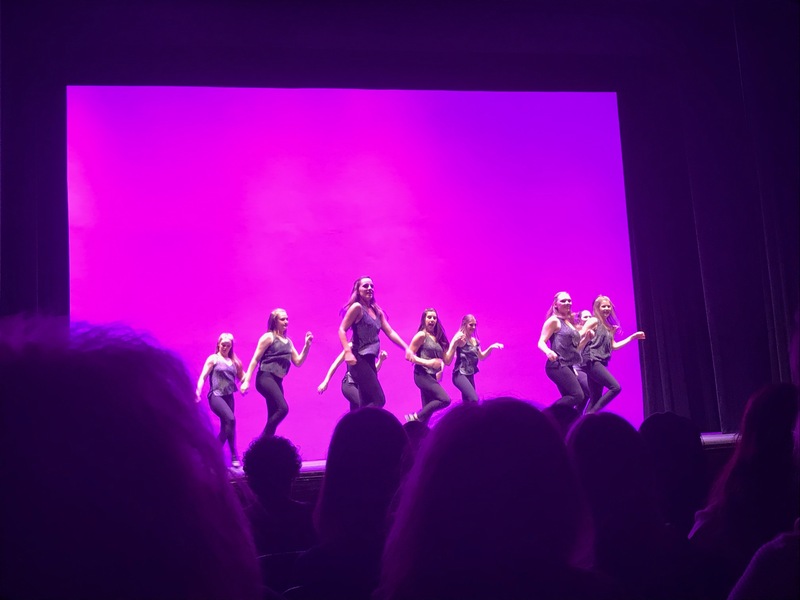 Though RhythM Tap Ensemble is not one of the most popular student dance groups on campus, their show was my favorite I’ve seen so far. Their rhythm, musicality and unique choreography combined to make a show that left me captivated even after the final curtain.